Corrosive storage cabinets from Absorb Environmental Solutions are available in two different types, powder paint finish and 100% polyethylene construction. 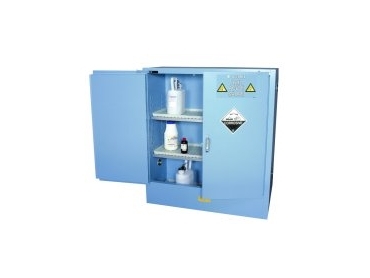 The polyethylene corrosive storage cabinets are required for chemicals with highly corrosive vapours. It should be noted that powder paint cabinets not suitable for substances with highly corrosive vapours such as Nitric and Sulphuric acid. All cabinets include polyethylene drip trays on all shelves.